Her papers stated her name as "The Duchess." I'm sure there was a much more involved name on those papers, but I was only about eight when we brought her home. 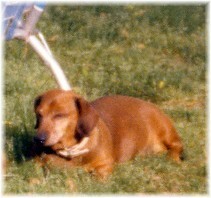 My maternal grandparents ran a boarding kennel and bred Dachshunds. We got Ducky, as she was soon known, on the promise that we would breed her at least once for Grandmom (that never happened due to a deformed pelvis….so Ducky was off the hook!). Ducky had been sired by old Jaguar, an eviler, meaner standard red, I've never met. He was the only dog at my grandparent's kennel I was truly afraid of. Ducky's mother, the venerable Nippy, was the best breeder I think they ever had, and she was such a good mom too. Often, she was very generous with us kids who invaded her nesting area and watched US like hawks with her broods. Ducky was to be our family dog, but our middle sister soon took her over and doted on her and even sneaked her into the double bed we shared—only to have the puppy pee all over the bed. My sister learned her lesson not to repeat that little move for a long time. No matter, her puppy hood, our "Ducky" was treated like royalty…all except for the positioning of her 'basket' down in the utility room. She never liked it, not once and made her distain known. It didn't even matter that on the coldest nights, and that room was chilly, that she was wrapped up in blankets and towels making a very snug little bed. She learned to snort at an early age. Ducky practiced with it and her snorts evolved into a fine art. You could just tell what she was thinking or saying. Now Ducky lived a good long life, until she was nearly 13 or 14, to my shame, I forget which, but the photo I cropped was 1980, so she was at least 12 then. What I can tell you about her is much, she was loving to all and sundry—except for cats, she was death on any strays that ventured into her fenced in domain. Oh, and if she ran downhill, her back legs tended to catch up with her front legs and she nearly ran sideways—comical at least, and she hated to be made fun of. She always knew when the joke was on her. Yet, it's is Ducky's verbal skills and interplay with the matriarch of our house that I'll focus in for now. It was the most amazing interplay to witness. After Mom and Dad converted the garage into a den with a sizeable Franklin woodstove, there wasn't a cold night that Ducky didn't want to rest her old bones on the big pillow just to the left of the firestones the stove stood on. Meanwhile, Mother could never tolerate anyone, and I mean anyone, person or animal, who would not follow her rules of decorum and propriety. When Mom went to bed, so did the dog. Ducky was to be in her basket after her last potty break outside. That's when it began…the sneaking back to her favorite spot and if Mom could catch her at it. You have to realize the layout of the house and how keen my mother's ears were and just how softly Ducky would tread, knowing her toenails clicked across the kitchen floor alerting my mother. The rest of the family, if awake, would watch and listen, and try NOT to snicker over it. Daddy felt so sorry for Ducky, we all did, but if she was to find her sanctuary, Ducky had to do it on her own---Ducky wouldn't accept less. (You had to know the dog, she had her own rules of decorum). The house was pretty much a standard rancher from the mid-fifties with prerequisite picture window in the living room, bedrooms on one end of the house along with the bathroom with a long hallway, then you were in the livingroom with the front door, which traveling through towards the back would bring you into the dining room. The kitchen off to the right—and off THAT was the utility room down a few stairs, which led to the backdoor, or the basement. In the dining room, there were sliding glass doors Daddy put in to lead to the back porch. Now, also, in the dining room was the entry into the small den, previously known as the garage. Thus, from the back of the house, Ducky had to come up the three stairs to the kitchen, traverse the linoleum and thru the dining area to gain the haven of the carpeted den and her beloved pillow next to the woodstove. I'm guessing, but I'd say an easy 30 feet…and it would take Ducky almost that many minutes to cover that space, one clicking toenail at a time. Keep in mind, Ducky wouldn't try this until she actually thought Mom was asleep in her bed. Mom often retired to read a book until she fell asleep. So, Ducky patiently waited about 30-40 minutes before trying. Mom, on the other hand, knew this little game well, she had three daughters after all. Often, Dad would be in his chair reading the paper or watching TV in the livingroom, we kids would either be watching TV with him or in our own rooms…listening. Sometimes Dad would take pity on Ducky and go get a bowl of peanuts in the shell to crack just to cover the sound of her toenails clicking on the kitchen floor. Usually, it would begin with Ducky getting about 15 feet, just to the entrance of the dining room, and she'd poke her head around and look for the all clear. She'd come, click-click, pause, click, pause, click-click, longer pause…it was hard to listen to…but Mom usually knew just how far to let her go. Then came, "Ducky! Get back in your basket right now!" Suddenly, there was, click-click, clickety-click-click, clomp, clomp, clomp, FLUMP! –down the stairs and into her basket. "Now you stay in your basket!" Mom would pronounce. No cracking of peanut shells could cover that. About five minutes later there would be a highly audible SNORT from the utility room, clearly heard throughout the house and directed at Mom. Mom heard it loud and clear. Some nights Ducky would try two or three times or just give up. But it was a trial over the last word, no matter who won the contest. When Ducky would snort, Mom would give a comeback, "You just hush up and stay IN that basket." Mom didn't even need to say her name, Ducky knew exactly who Mom was talking to. Then Ducky would wait another five sometimes ten minutes, and snort loudly again. After a while it was comical. My mother arguing with a dog, and the dog holding her own. Don't get me wrong, my mother wasn't rigid, actually, when caught the right way, she could be the softest touch in the world. She'd just rather nobody knew it, least of all her kids, all girls and all adversaries the way it has been through millennium. On the very coldest of nights that Daddy kept the fire in the stove working, Mom would pretend she didn't hear Ducky clicking across the kitchen floor. Ducky was grateful, but often gave a victory snort as well once she got settled into her warm pillow by the fire. The relationships we forge with our families and our pets, the rites and rituals and proprieties we sometimes give due to only because they are expected. The little dance that Mom and Ducky played for YEARS will be a beloved, humorous memory for all my days. Some nights Ducky won, but mostly it was Mom, and sometimes Mom relented—and Ducky was grateful but with her royal title, she knew her due and took it as just. Ah, how I miss her. How I miss them both. As a child, I considered my mother's sharp words a terror and tried mostly to abide by her rules. What I didn't even guess at is even Ducky knew Mom was the softest touch and best player of the games. Ducky knew each of us heart and soul, and she loved us all with devotion, cowing only to Mom. As an adult, I learned. Thus, know our four-legged friends often know more than we, for they know who we are innately. There is no hiding goodness or evil, they are NOT dumb animals. So, cuddle your pets and play with them and love them with all your heart, realizing they know you better than you think they do.